We’re happy to announce the release of the latest Bitcoin Gold Wallet! Import the PGP public key and check the signature of SHA256SUMS.asc. This step ensures the downloaded checksum file is the official one. Calculate the sha256 hash of the binaries and check that it matches the corresponding value in SHA256SUMS.asc. gpg: Good signature from "h4x3rotab <[email protected]>"
This does not mean the signature is not valid; it just means that the process was run without first adding h4x3rotab’s public key to the trusted list. The example shows how the output would look if you run it without taking any extra steps. If you add h4x3robat’s key to your trusted list, that warning will go away. 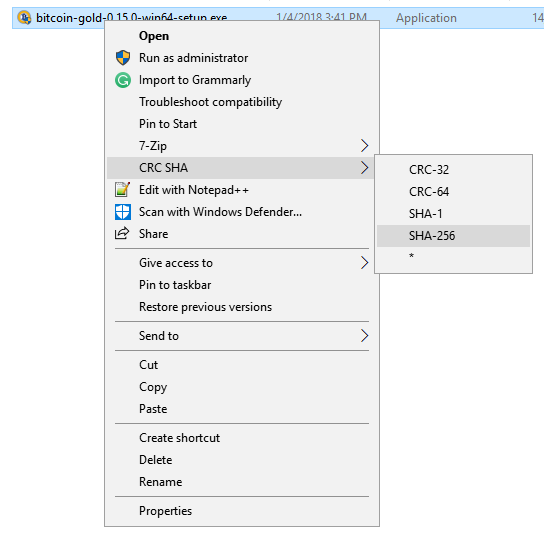 Use Quickhash free software to check any SHA signature under Windows also. I wasn’t aware of that one; thanks. Indeed there are many ways of verifying that. Only verifying the hash is not sufficient. It can’t protect you from MITM attach. So the full solution is to validate both the sha256 checksum and the PGP signature in the checksum file. Only verifying the hash is not sufficient. Thanks! You’re right, of course… but we can’t expect all of us Windows users to do that. If we can get them to check that SHA-256, they’re making a big improvement over what most of them do today. yeah! Its a huge achievement for Bitcoin Gold. I’m sure others will reply soon to help you out with your connectivity problem. 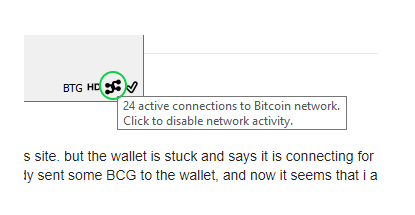 It will help if you give a little more detail - confirm which version of the Bitcoin Gold wallet you’re running (or when you downloaded it), what kind of computer (PC, Mac, Linux), confirm that you made sure your computer’s firewall is open so that the wallet can connect to other nodes, etc. That was a curious choice to make, sending coin to a wallet address before the wallet software was fully up and running - but, regardless, the coin transaction happens on the blockchain, not in the wallet software. The wallet software just shows you the status on the chain. The coin you sent should be fine, as long as you sent it to a valid address. thanks. i downloaded the wallet a couple of days ago. i know it was not very smart to transfer the coins… water under the bridge. i can see the coin in the Blockchain explorer … so i believe we are fine. i just need to access it. my computer shows 0 active connections. so i assume this is the problem… do i need to open a port on the network? where can i see my private key? What does “stuck” mean? Did it ever started to sync? You can use the dumpprivkey command in the debug console to extract the key. If you don’t need the full node then go for ElectrumG (https://github.com/BTCGPU/electrum/releases) and import you private key there. thanks, it started to Sync. To be fair, this was not our design - the wallet functions the same way as the Bitcoin Core Wallet: this is our fork of an industry-standard full-node wallet. While it is an Official wallet and is part of the backbone of the Bitcoin Gold infrastructure, it is not the best choice of wallet for a novice who does not want to learn more. There are consumer-oriented wallets which are probably better for that purpose. Even if there are ample consumer-oriented wallets, there is still a need for a full-node wallet like this one - it’s just not for everyone’s specific situation.